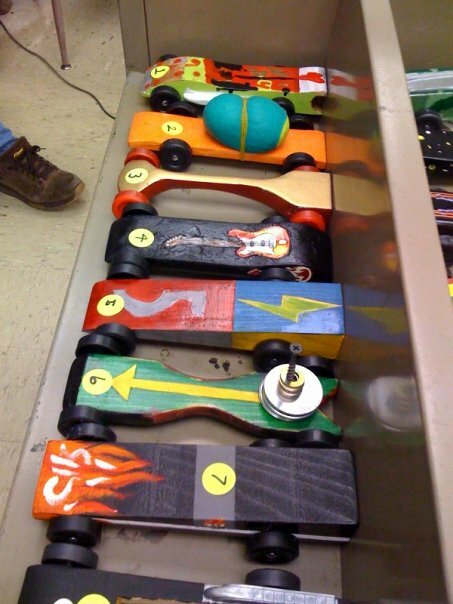 Read Pinewood Derby Part 1 of 2 here. So, race day finally arrived, and all the Moms in the Pack heaved a sigh of relief as the stress and pressure was soon to come to an end. Of course there is the Derby itself to get through. The build-up and angst of the actual race as depicted in the movie Down and Derby were not far off the mark. I highly recommend the movie, by the way--we showed it at our Pack Meeting and both the kids and the parents were in stitches! 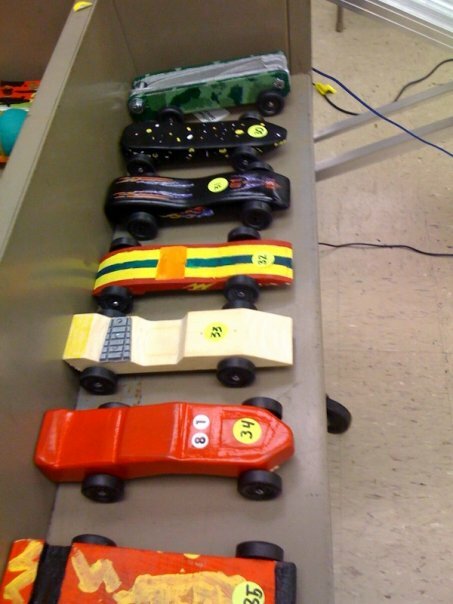 There is so much tension and the kids have invested so much time into making their cars, that it really is heartbreaking if the car does not run well. There are always some cars that can't seem to make it across the finish line and need some help from the hand of God, or the Scout Leader running the races, anyway. What is very positive and enjoyable for everyone, is seeing the results of all the hard work from the kids (and Dads) as they check their cars in. From starting with the same block of wood, 4 nails, and 4 plastic wheels, the divergence is a beautiful thing. Teddy had remarked to us how this was his last chance to win the Pack trophy since he was crossing over to Boy Scouts this year. We reminded him that about 50 other boys were also racing, and most of them would graduate to Boy Scouts without winning that trophy either. We didn't want him to be overly focused on the #1 spot, when there were many other things to be proud of. Placing in his own rank/den would be enough to be proud of, as was just having made his car from scratch. Barley, on the other hand, flush with success from having won his rank's first place trophy at the District Derby last year, went into the race very confident. This didn't last. Heat after heat, his car came in second or third--a new experience for him. This was the 3rd Derby for most all of the scouts in his den, and they (and their fathers) have all learned over the years. They all know the tricks of polishing the hub, wedge or flat shape, weight in the back of the car, polishing the axles, etc. There are many books on the subject to be had, and they had clearly been read. Behaviour was not great from Barley. After the first few races, when it was clear he was not going to win in his rank, he decided to play outside instead of watch the rest of the Derby. He was accompanied by a dozen other boys with limited attention spans and poor prospects. As the evening wore on, Barley grew surlier and surlier, culminating in him kicking me in the shin when told to return a toy back where it belonged. A typical tension-filled evening when Barley does not get his way. We were fortunate to get a copy of this picture from one of the parents. 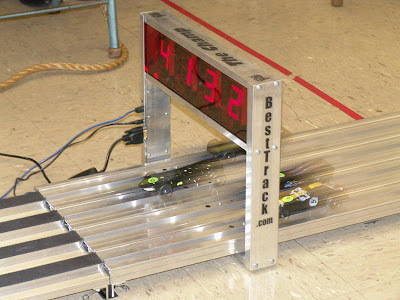 Teddy's car is the clear winner crossing the track. Teddy was extremely happy when he received his trophy. So were DH and I. Unfortunately, his little brother was outside sulking, even missing his certificate of participation and the 3rd place ribbon for his den. DH spent so much time managing Barley, he missed the presentation of the certificates, which he had coordinated. We made up a title for every child, some as silly as "Biggest Washers" or "Best Jackson Pollack Paint Job". We weren't sure if the kids would like them, or think them hokey. Judging by the smiles and pictures taken, I think they had the intended effect--which was to recognize the effort of every child who participated, even the siblings. The winner of the Dad's race won only bragging rights--it was a foregone conclusion as soon as we saw his paperclip thin wheels (standard Derby rules had been waived for the adults). He seemed to enjoy that just as much as if we had handed him a trophy! I'll just add that as disappointed as I was with Barley's reaction to his car's performance, I was very, very proud of the amount of effort and dedication he put into his car this year. For the first time, it really felt like this car was _his_, made with my supervision, but from his design and with mainly his work. Unfortunately it was a bit too delicate for the rough and tumble derby and had some technical breakdowns. But bravo, Barley, for building a beautiful car! And cheers, Teddy, for our first (and likely last!) family Pack Winner! Thanks, too, for someone who gave us all the time we needed to build our cars and didn't even make fun of us. Much.